Senator Susan Collins answers questions from reporters about Supreme Court nominee Brett Kavanaugh on September 17, 2018. MAINE REPUBLICAN Susan Collins is one of just a few senators who has remained publicly uncommitted on whether to confirm Brett Kavanaugh to the Supreme Court. 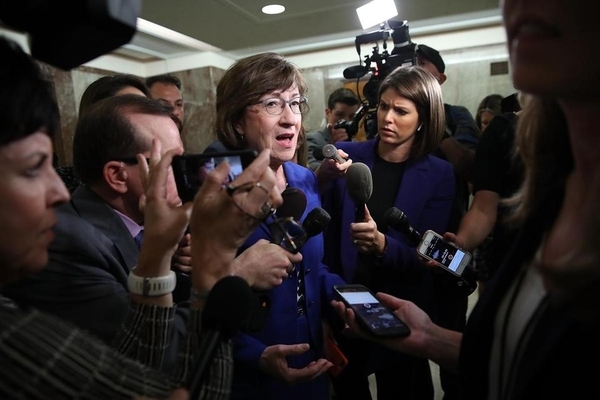 So opponents of the nominee have been doing whatever they can to persuade Collins to come down against him — writing impassioned letters, holding a protest march, publishing editorials, and running TV ads. And pledging — if Collins ends up supporting Kavanaugh — to contribute money to her next Democratic opponent. 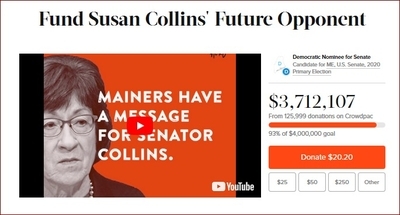 Two liberal activist groups — Mainers for Accountable Leadership and the Maine People's Alliance — have launched a put-your-money-where-your-mouth-is crowdfunding campaign to pressure Collins into voting no on Kavanaugh. As of Tuesday afternoon, more than 49,500 people had signed up, agreeing in advance to donate nearly $1.4 million to Collins's as-yet-unidentified 2020 Democratic challenger. Nearly all the pledges are for $25 or less, and the donors' names are publicly posted. Their contributions have been made by credit card, with the stipulation that the charge will be processed only if Collins votes in favor of confirmation. So far, so normal. What could be more typical of democratic politics, after all, than lobbying elected officials, or working to defeat them if you disapprove of their performance in office? Yet to hear Collins and some of her supporters tell it, mobilizing donors to fund a future challenger isn't citizen activism, it's an illegal bribe. Or maybe it's attempted extortion. But in any case they're sure it's something illegal. They want the Justice Department to investigate the crowdfunding as a violation of Title 18, Section 201 of the United States Code, which makes it a crime for anyone to "corruptly" offer "anything of value to any public official" in order "to influence any official act." Some say that's a credible allegation. I say it's spinach. Collins blasts the fund-raising pressure campaign as an unlawful "quid pro quo . . . an attempt to bribe me." But that can only be true if bribery now includes giving ordinary voters a platform for uniting to hold public officials accountable. Which would be ridiculous. Organizing grass-roots opposition to a politician's decision is not a bribe or extortion: It is the very essence of democratic engagement. And it's irrelevant whether that opposition takes the form of collecting signatures on nomination papers, registering new voters, staging a public protest — or pledging to donate 20 bucks to whomever runs against her the next time she's on the ballot. Multimillionaires with strong political views routinely pour money into backing or opposing candidates on the basis of stands they take and votes they cast. I see no problem with the rich using their financial clout to affect election campaigns. I see no problem with the non-rich pooling their resources to do the same thing. Over the years, Collins has accepted millions of dollars in campaign contributions, great swaths of it from individuals and political action committees affiliated with specific industries or companies. Many, probably most, of those donors have strong views about matters that come before the Senate — matters on which Collins's vote could be crucial. If those contributions don't run afoul of the anti-corruption statute, then there is nothing unlawful about the anti-Kavanaugh crowdfunding campaign. Multimillionaires with strong political views routinely pour money into backing or opposing candidates on the basis of stands they take and votes they cast. They do it on the left, as when hedge fund executive Tom Steyer announced that he would spend aggressively to defeat incumbents who didn't oppose the Keystone XL pipeline. They do it on the right, as when industrialists Charles and David Koch offered to pay for ads and direct mail supporting members of Congress voting to kill the administration's health care bill. I see no problem with the rich using their financial clout to affect election campaigns. I see no problem with the non-rich pooling their resources to do the same thing. Naive romantics or public-campaign-finance purists may think it unseemly for political donations to be influenced by policy decisions. But Collins is no naif, and she does herself no credit by pretending to be shocked — shocked! — that voters and donors intend to hold her accountable for her vote on Kavanaugh, or on anything else.